Cities develop in phases. When we look at the history of Indianapolis, we can see this. The “Mile Square.“ The Central Canal. The railroads. The sewer system. The Kessler Park System. The interurbans. The monument plazas. The interstates. The “Amateur Sports Capital” schemes. All of these projects came in successive waves of urban development. We are in the midst of yet another phase of planning and development. Everywhere we turn downtown, we meet with new construction. Public-private partnerships abound. The Mayor’s Office, Plan 2020, and Great Places 2020 seek to reshape communities outside of the downtown core. And, approval for the Red Line BRT may be the first step towards a new transportation infrastructure. As these projects are moving forward, it seems worthwhile to step back — to take a moment to reflect on how we are building. 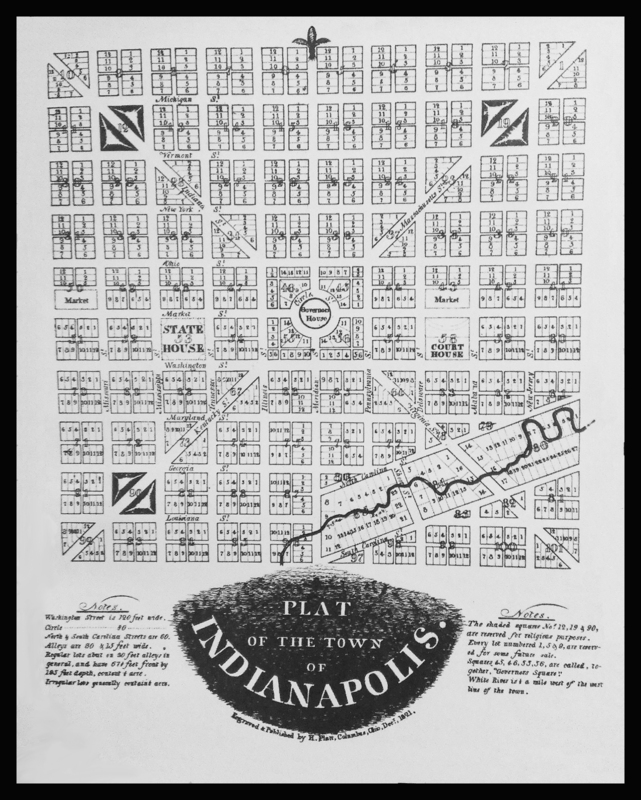 Indianapolis has always been a planned city. Alexander Ralston’s original plat, published in 1821, set the template. The city’s grid pattern and diagonal boulevards were derived from Renaissance concepts of the “ideal town.” The ideal town was one built new, from the ground up. Its infrastructure and architecture were designed to be harmonious and beautiful — to reflect the ideals of the citizenry and to improve daily life. One of the most interesting things about ideal towns — and planned urban projects more generally — is that they reveal the assumptions and value systems of the people who build them. Take Ralston’s plan for example. At the center of his city was the Governor’s house (where the Soldiers and Sailors Monument now stands). Two blocks to the west was the state house, and two blocks to the east was the court house. Strolling along Market Street citizens could see all three branches of government: the legislative, executive, and judicial. He placed the Governor’s house at the center of the city, not to highlight executive power, but to show that the Governor was always under the watchful eyes of the citizenry (much to the chagrin of First Lady Esther Ray). At the far ends of the diagonal boulevards, he designated blocks for “religious purposes” — physically separating church and state. In Ralston’s model, Indianapolis’ built environment became a microcosm of the early American republic. There are of course less savory versions of urban planning. From the early 20th century came a succession of plans to remake Indianapolis. Among these were Edward Pierre’s Cross Roads plans, which he began developing in the 1930s. Pierre was one of Indianapolis’ most accomplished architects and a prominent voice in the planning community. He is perhaps best remembered for his proposal to recreate the city center. Reworking Ralston’s model, he planned parking hubs at the edges of the Mile Square, with expressways that efficiently moved people from the suburbs to downtown. West Street would have been turned into a highway, effectively cutting off the Near West from Downtown. At the same time, he targeted areas of the city largely populated by ethnic and racial minorities for “slum clearance and beautification.” His ideal city reflected the dominant mode of urban design of the period — one which was cut through with racism and classism. As we think about the current wave of planning and construction, we might consider how new projects express ideals — what unspoken, or even unrecognized, assumptions and value systems underlie our projects. No single development can answer all needs for all people. But, when we look at the sum of the projects, what is the overall message that they send? How will our descendants read our values in our built environment? For whom are we remaking this city?